A friend of my daughters wanted me to make her a birthday cake for her. I was told it was to be laser themed, a white cake on the bottom and a dark cake on top. So after spending a few days thinking about it, I came up with this idea. I loved making this cake, and how cool does it look all lit up. 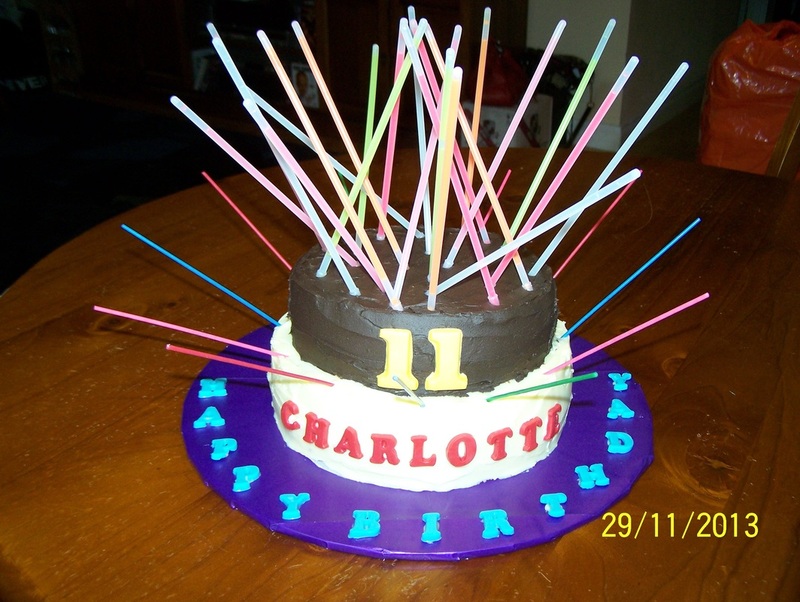 This is so easy to make, two cakes and loads and loads of Party Glow Bracelets. I even found the long thin candles that looked great on the cake. 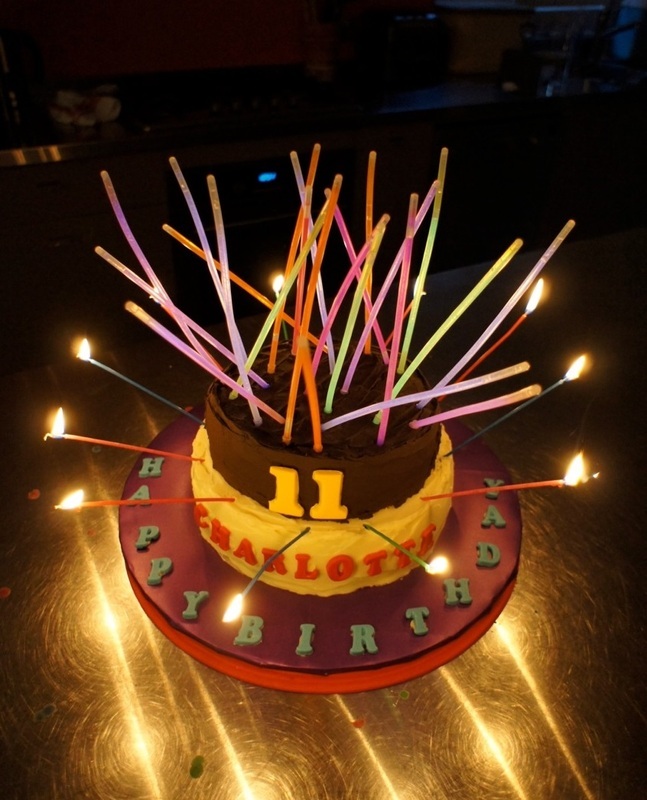 When you put the glow bracelets in the cake, don't crack and activate them, that is best done close to serving to ensure all the glow bracelets are as bright as can be. Coloured candy melts can be purchased in specialty shops. In Westfields, Bondi, you can find them in Plenty. 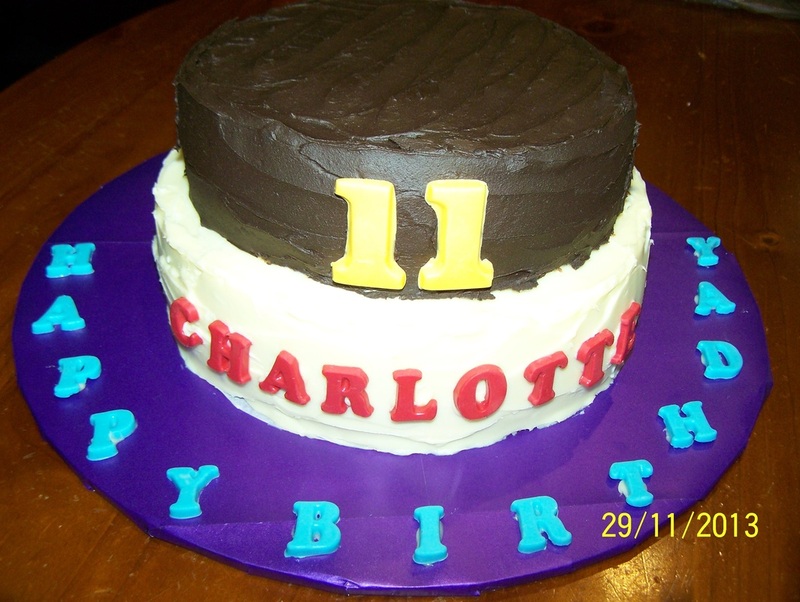 I had so much fun making this crazy cake, it is still one of my favourites. 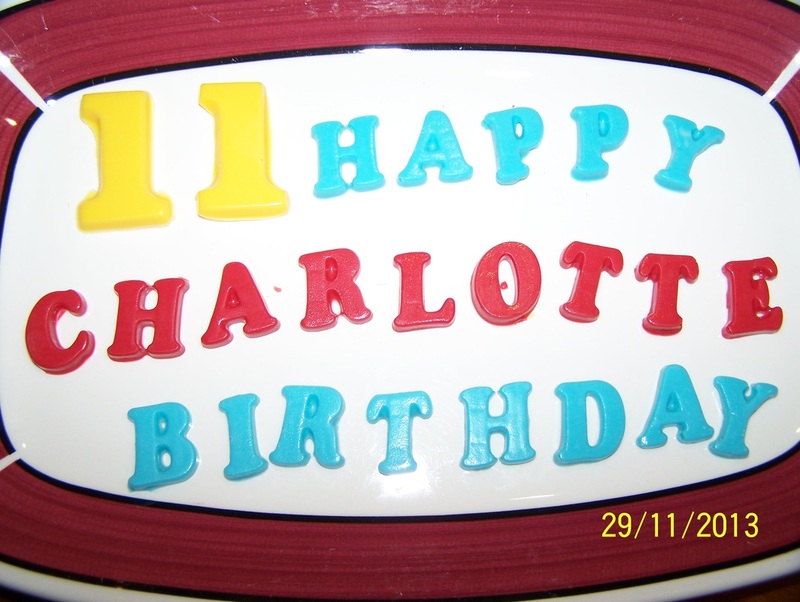 First I made the Happy Birthday 11 Charlotte , as this can be done up to a week before they are needed. Place enough blue candy melts (to spell happy birthday) in a heatproof bowl over a pan of simmering water. Don't let the water touch the bowl. Stir until melted. Spoon into a piping bag, and pipe it into the letter moulds. 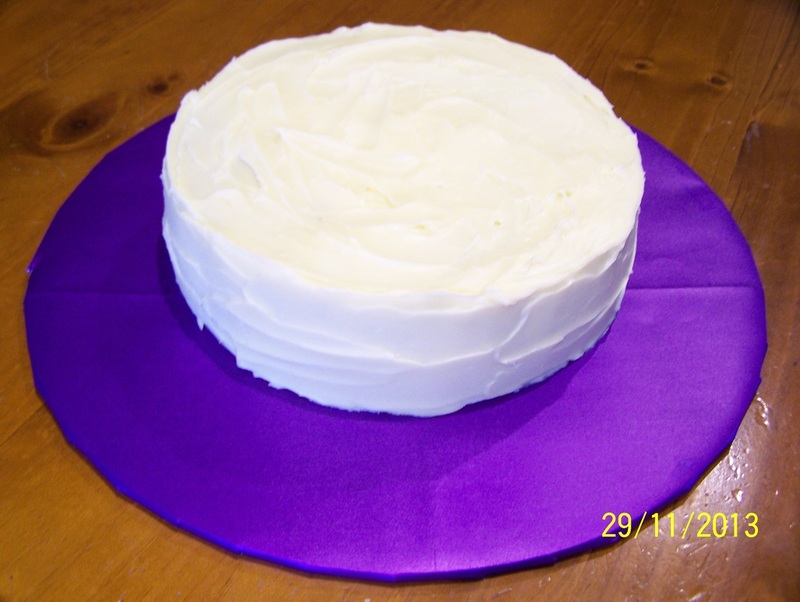 You can use a teaspoon to do this, but it was easier to use a piping bag. Refrigerate until set. Once set, they pop out quite easily. Repeat process with yellow and red candy melts. Make the chocolate mud cake and the triple choc marble mud cake (up to the step where it is baked and cooling). I made one, 3 days before, and the other 2 days before, but you can do it even 5 days before. The day before needed (up to 2 days before needed), make the white chocolate ganache and the chocolate ganache as per the recipes I have on this site. Spread a thin layer of the white chocolate ganache all over the chocolate mud cake and refrigerate for 30 minutes. This ensures all the cake crumbs stick to this layer of ganache and don't ruin your final layer. Now cover the Chocolate Mud Cake with the White Chocolate Ganache-focus on the sides and the top rim as that is all that is going to be seen, but do cover the whole cake. Place the cake on a covered cake board. Spread a thin layer of the chocolate ganache all over the triple choc marble mud cake and refrigerate for 30 minutes. This ensures all the cake crumbs stick to this layer of ganache and don't ruin your final layer. Now cover the Triple Choc Marble Mud Cake with the Chocolate Ganache. 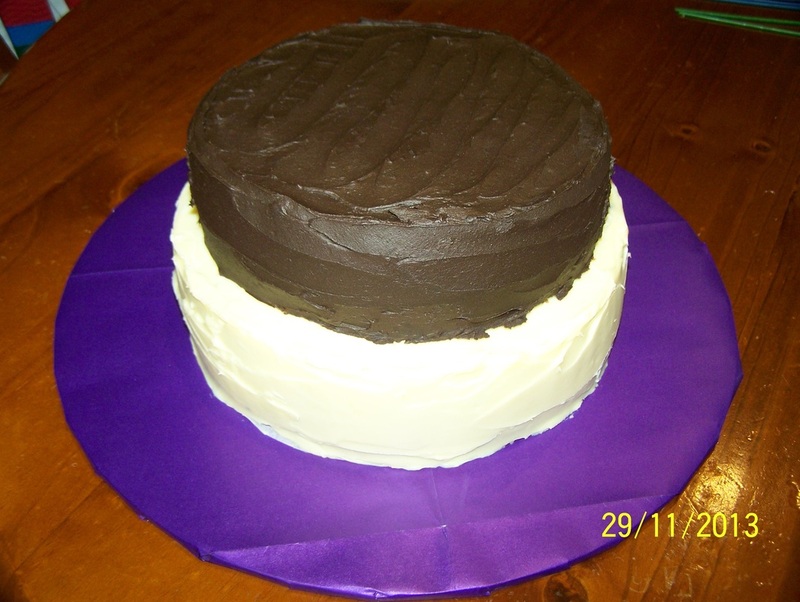 Place the chocolate ganache covered cake carefully on top of the white chocolate covered cake. Decorate with your prepared letters and numbers. Place the connector bits of the glow bracelets on one side of the glow bracelet. Here you can go nuts doing whatever you like, arrange the glow bracelets into the cake, connector bit down. Don't crack them yet, they need to be pulled out and cracked up to an hour before needed for full brightness. Position the candles on the cake.